Pets are often treated as members of the family and owners rightly want to be sure they receive excellent medical treatment. Horse owners and farmers also want to ensure their animals are receiving the best possible veterinary care. Our regulatory function means that users of veterinary services can be assured that their veterinary surgeon or registered veterinary nurse is properly qualified and fit to practise. We can also offer reassurance that those practice premises which we accredit as part of our Practice Standards Scheme meet stringent standards. 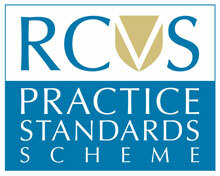 The RCVS Practice Standards Scheme (PSS) is a voluntary initiative to accredit veterinary practices in the UK. Through setting standards and carrying out regular assessments, the Scheme aims to promote and maintain the highest standards of veterinary care. To become accredited, practices volunteer for rigorous assessment every four years and will have met a range of minimum standards including hygiene, 24-hour emergency cover, staff training, certain types of equipment and cost estimation procedures. Practices are also subject to spot-checks between assessments. RCVS accreditation is not to be confused with a practice being included in the RCVS Register of Veterinary Practice Premises (RVPP). We hold the RVPP on behalf of the Veterinary Medicines Directorate, and only veterinary surgeons working from registered premises can supply veterinary medicines. On top of the accreditations practices can now apply for awards, further information can be found on the Practice Standards awards page. For peace of mind, look for the RCVS accredited practice logo, which indicates that the practice has passed an independent assessment. This means high standards of care for animals and peace of mind for animal owners. The logo was updated in 2011 (pictured left below), however you may see our old logo (pictured right below) in use as well. Currently, around 65% of the UK’s practice premises are accredited under the Scheme, and this number continues to rise. To check if a practice is accredited or has gained an Award, use our Find a Vet service.